Broadway blockbuster “Wicked” returns to Salt Lake City for an extended third run through August 24 at Capitol Theatre. The musical is the adaptation of Gregory Maguire’s 1995 novel “Wicked—The Life and Times of the Wicked Witch of the West” which takes the well-known and well-loved story of “The Wizard of Oz” and turns it on its head. 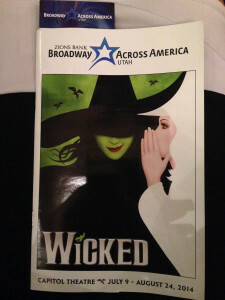 With music and lyrics by Stephen Schwartz and book by Winnie Holzman, Wicked explores the complicated relationship of Glinda the Good Witch of the North (performed by Gina Beck) and Elphaba the Wicked Witch of the West (Emma Hunton) as they meet in school, become friends and mature into adult witches—all before Dorothy and her farmhouse land in Oz. You’ll also learn the back story behind the tinman, scarecrow and cowardly lion who wind up following the yellow brick road as well as who was really responsible for those flying monkeys. Even though “Wicked” premiered on Broadway ten years ago, the political chaos and difficult decisions the witches find themselves facing are as relevant today as ever. A leader who pits citizens again each other, discrimination and bullying are all part of what makes “Wicked” tick with audiences around the world and at all stages of life. As often plays out in real life, neither of Wicked’s heroines are infallible. Hunton plays the role of Elphaba with awkward perfection. Not comfortable in her own emerald-green skin as the curtain rises, Elphaba learns to trust in herself and what she believes is right—despite the consequences. And although Glinda’s growth is based on the desire to be popular—with her classmates first and then with her followers in the Land of Oz—Beck’s nuanced acting offers a snippet of snark behind the perky and pretty exterior, making her less of a character you love to hate. Beck and Hunton are powerfully matched on stage and perform admirably with love interest Fiyero (Nick Adams) as well as Tim Kazurinsky’s portrayal of The Wonderful Wizard of Oz. Which witch is really wicked? You’ll just have to see “Wicked” to find out! The Salt Lake production welcomes nine local musicians to the show who perform alongside the traveling orchestra. Tickets are still available to many shows and can be purchased online at ArtTix.org or by phone at 801-355-ARTS (2787). 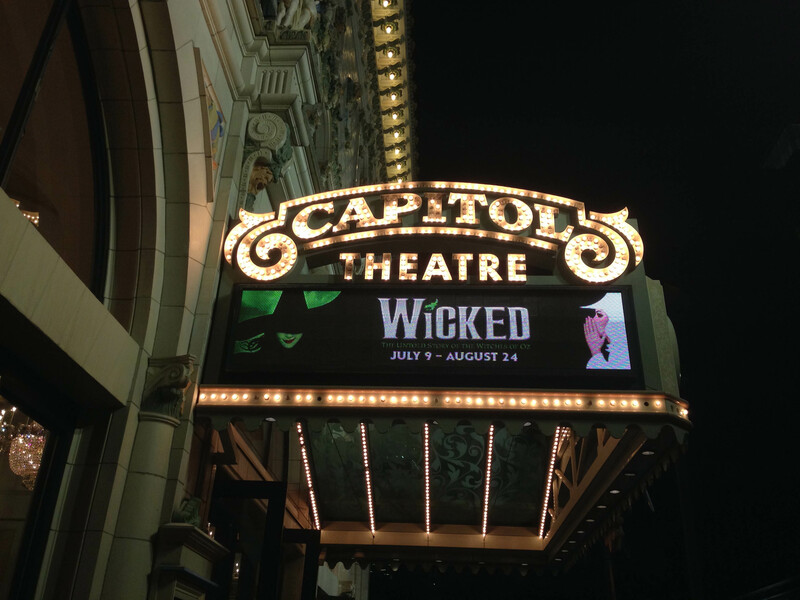 Wicked will play through August 24 at the Capitol Theatre. Show times are Tuesday – Thursday at 7:30 p.m.; Friday and Saturday at 8 p.m.; Sunday at 6:30 p.m. with matinees Saturdays at 2p.m. 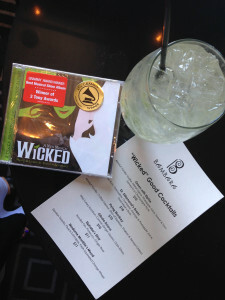 ; and Sunday at 1 p.m.
During the run of Wicked in Salt Lake, across the street at Bambara inside the Hotel Monaco, The Vault is pouring some Wicked-themed cocktails through August 24. Austin Craig, head bartender at Bambara, is delighting dining guests with a new roster of six signature cocktails when they join Bambara for a pre-theatre meal or head to The Vault for a post-show wind down. 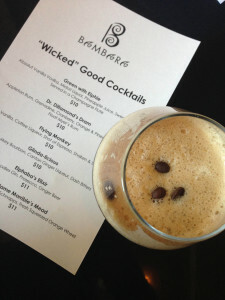 For Sunday matinees at 1 p.m., Bambara’s weekend brunch is a nearby option and the restaurant will also open early on Sunday evenings at 5 p.m. so guests can make it to the 6:30 p.m. curtain call.